If you have purchased a steam generator iron, then most likely you will know that they do not sit that well, if at all, on an ordinary ironing board. The best thing to do is to change the ironing board, for one that is designed specifically for that purpose. Initially that maybe a little expensive, but it really is a long time investment, and one I believe you will not regret. It is certainly much safer, and makes your ironing experience, a great deal better. It really is all about size, and especially if the board has been designed to hold a steam generator iron, which are of course usually much bigger than a traditional steam iron. Steam Generator irons are also a great deal heavier than normal steam irons. As such they also need more support, especially at the end of the board where the water tank will be sitting. If﻿﻿﻿ you would like to read about the best ironing boards for normal steam irons, then please click here. This article though deals with those boards designed for specific use with the larger steam generator irons. 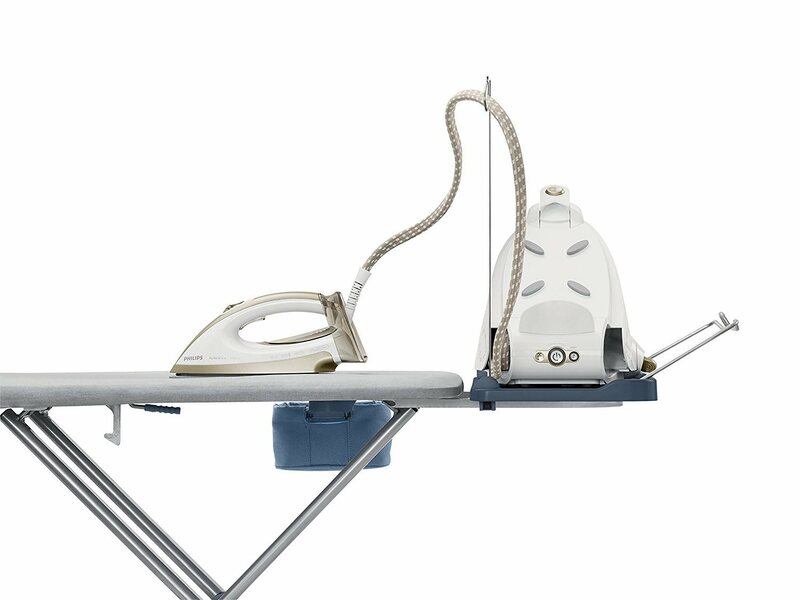 A typical size for a steam generator ironing board is around 46.5" by 14.5" ( 120 cm x 38 cm) These type of irons are also heavy so please make sure that whatever board you buy is both strong and durable. That is important because most steam generating irons have large heavy water tanks, and need strong support. A large water tank when filled can be very heavy as I am sure you will appreciate. These irons also create and use a lot of steam. A key consideration when buying an ironing board for these iron types is to make sure that whatever it is made from will not rust. Ideally you want a metal construction, that has been coated in a hard wearing plastic. This is especially true for the area at the end of your board, where the water tank element will sit. This area carries the main weight, and will also get a lot of steam. Therefore, make sure that, the material or coating in that area will never rust. You also need to check that this end can cater for both the size and weight of your iron. Most good brands will tell you what size and weight this can withstand. This applies to any ironing board. We are not all made the same size, so make sure the height of your board can be adjusted, to suit your height and make you comfortable. Good quality ironing boards will have at least 4 height settings. If you look at the image to the right, you will see this has a number of positions that you can select. This is almost as important as the board itself. You will want this to be high quality, heat resistant and easy to clean. They come in padded, metallic and mesh styles. They also come in different patterns. The important thing though is that they should make your ironing easier and faster. If buying a padded one, make sure it is at least 6 mm thick. Ironing boards are useless and in fact dangerous, if they are not stable when up and being used. Ironing boards can be placed on tiled floors, wooden floors and on carpets. You want to be 100% sure this is not wobbly, and that it has rubber feet to prevent slipping. If you are spending a lot of money on one of these boards, then make sure that there is a really good guarantee. 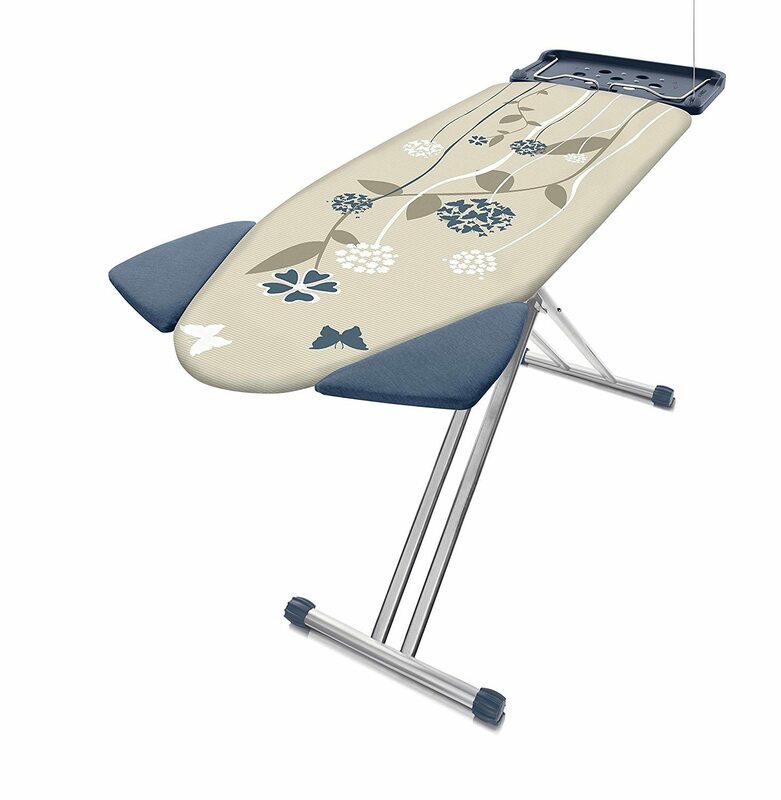 10 years is not unreasonable to expect with one of the higher quality ironing boards. These are expensive purchases, so make sure that you get the guarantee of quality, for a long period of time. Below I have included some reviews on the highest rated boards by actual buyers which I hope you will find very useful. This board is one of the most popular choices for people who use steam generator irons. It can handle all of the popular makes and models. This board has a cotton cover with a foam and viscose underlay, for better and smoother ironing. It also has a child safety lock which is a great feature. It also has an impressive 10-year guarantee and you can't really ask for more than that. There is little question that this board has been built specifically for the larger steam generator irons. The wider board helps reduce the amount of time spent on ironing as you can iron more of the garment at a time. It sits on four legs which have protective caps on them and this prevents damage to wooden floors. 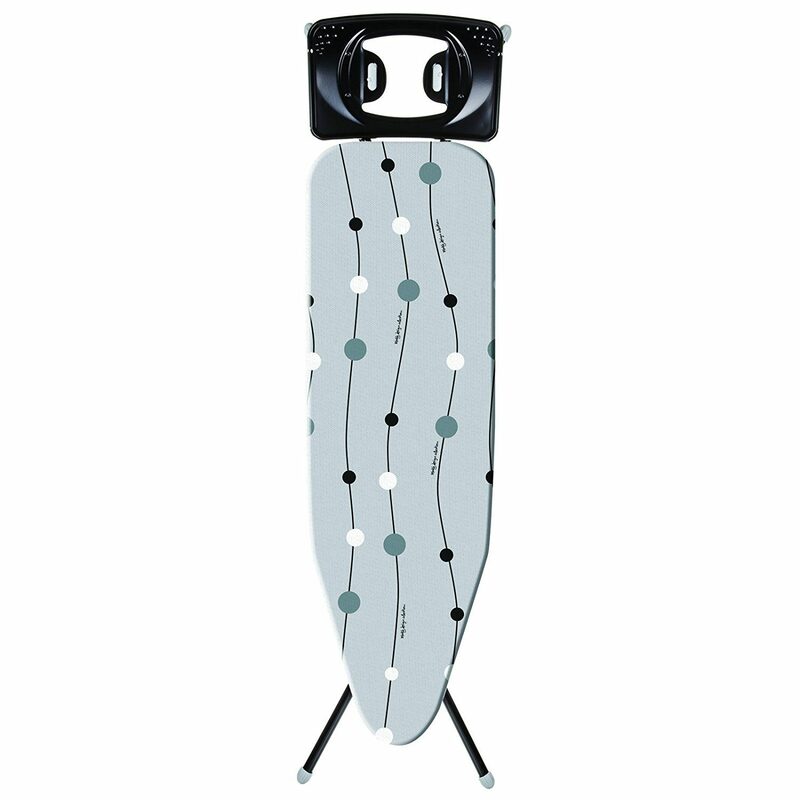 This one comes in a number of different sizes which are B, C and D.
Online buyers have given this ironing board an overall average rating of 92%, which is very high. The cover is made from 100% cotton and is foam based. Underneath this is a viscose underlay. That helps keep the cover very smooth and that of course all works to make your ironing easier, and eliminate any chance of ironing in wrinkles. 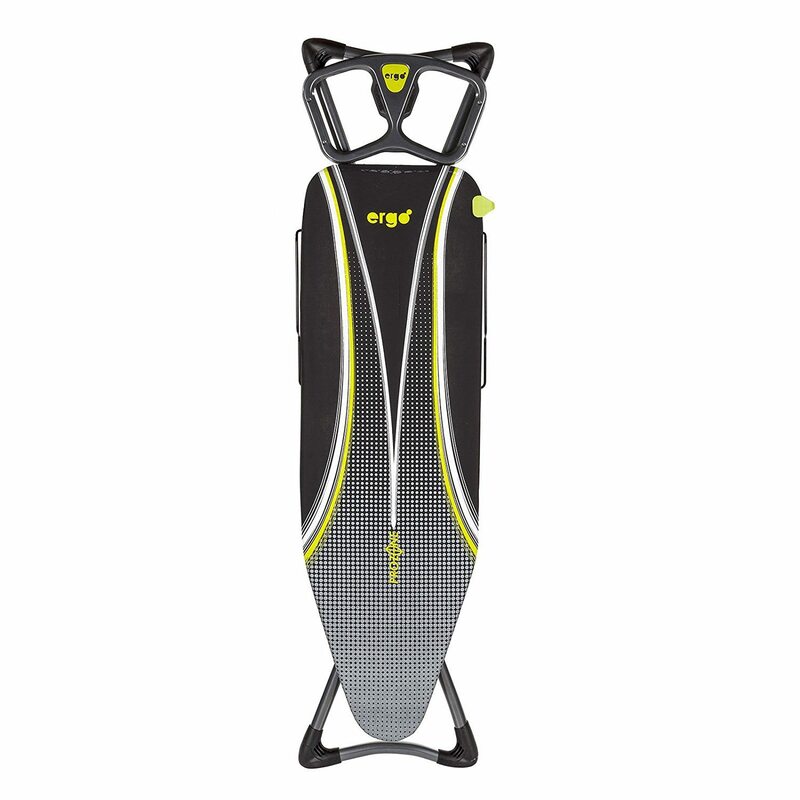 This particular board is the most popular buy for most people. The most popular choice for most people by a very long way is the Size B option. Those who like a wider board to iron sheets should opt for a Size C.
The average price for this option is around £80. Then, there is an option to get this one with a linen back. However, that will add another £40 to the standard price, which makes it pretty expensive. Still, at least you have the option, which you do not get with many other brands. It is great and very useful for ironing those larger items. Overall online buyers have rated this model with a 92% buyer satisfaction rating. It also has a shoulder shape for shirts and blouses, and a pointed side that has been designed to make ironing trousers a great deal easier. The surface itself is made from a foam and viscose and that helps ensure that you do not get wrinkles in your ironing. There is a heat resistant parking pad where you can temporarily set your iron and it will not burn. That I think is particularly useful. This board from the Minky brand is priced at around £50, and is one of the most affordable on the UK market. This one gets a high rating of 80% from the many online buyers. That is a solid rating and one that has remained consistent over time. This one comes comes with a 5-Year Guarantee. This board is suitable for both left and right handed use The cover is made from 100% cotton and has a deep felt underlay. The cover also has a heat reflective metallic coating. There is also an infinite height adjustment feature. This board is sturdy and of good quality. It is a good size and doesn't shake while ironing. This board is from the well liked and respected Philips brand. 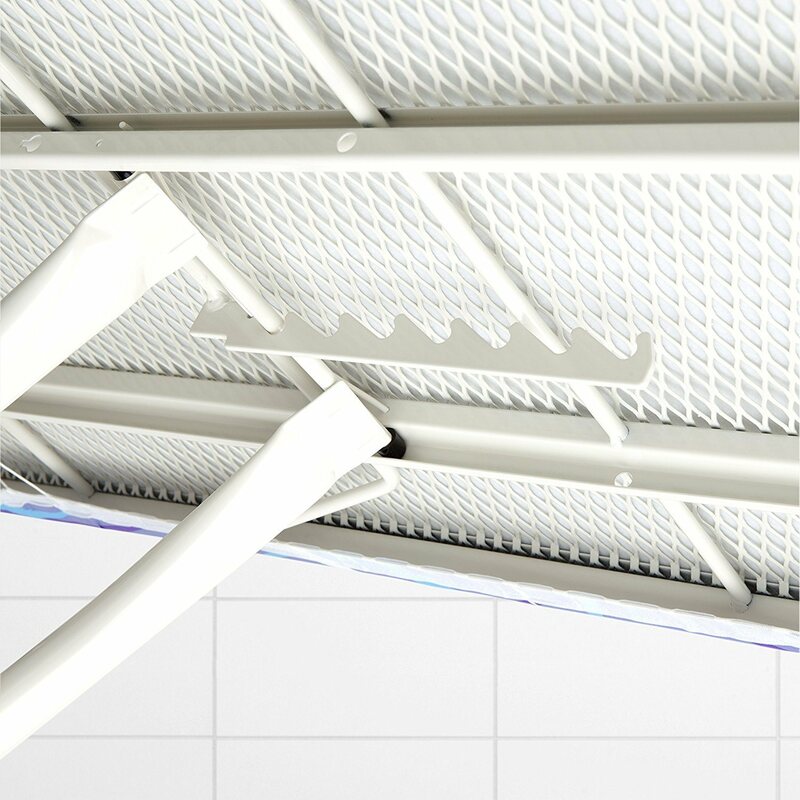 As you can see from the image above, this boards has a specially designed "Shoulder Wing" System. That does make ironing shirts so much easier. It can be left open or folded closed, depending on what type or garment, you are ironing. It also has a shirt hanging rail and storage basket. That makes it a pretty complete choice. It also has child and transport safety locks. The cover is made from 100% cotton and is supported by foam and felt layers. This one also gets a high rating of 86% by online buyers.That is a very good rating and one that has remained consistent over time. The average prices is around £130, so certainly not a cheap option. It measures 49 x 11 x 159 cm and weighs 9 Kg. This is a very good choice if you have a lot of shirts to iron. Yes its expensive but it is big, stable and it can support the weight of your ironing station very easily. Also, the board allows steam to pass through. The ironing boards listed above are all quite expensive. Therefore if you need to work to a smaller budget, then this one from the Minky brand will do your job very well. This one is priced at around £33-37. It does not get as good of reviews as the ones above, but then again it is less than half the price of either of those. Buyers rate this one at 76%, but there have been plenty of UK buyers. It measures 173 x 45 x 9 cm and weighs 6 Kg. The fully adjustable height is really good on this one, and most of the complaints are about the cover. The irons are already expensive enough when you buy them. I am sure most people do not want or need any other expense. Getting a good board though for one of these is I think very important. I know they are not cheap. However, when you have splashed out on a steam generating iron, you may as well have a good board. When combined, you have a great ironing setup to work with, that will last you for a very long time. More importantly it really will cut your ironing time in half.